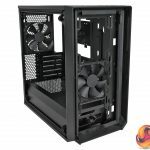 Home / Component / Cases / Fractal Design Meshify C Mini Review – Meshify C Gets Smaller! 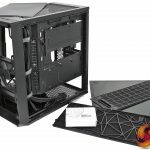 When Fractal Design launched the Meshify C ATX case we knew it was only a matter of time before we saw a smaller version and six months later we have the grandly titled Fractal Design Meshify C Mini TG Dark Tint. We might try to jazz up this review and claim we’re looking at an entirely new case but the truth of the situation is that Meshify C Mini is a Micro-ATX version of the Meshify C.
This means the Mini stands 41mm lower in height than its ATX brother and the reduction in height means you can no longer install a 360mm radiator in the front of the case, although you can fit three 120mm fans if you choose. 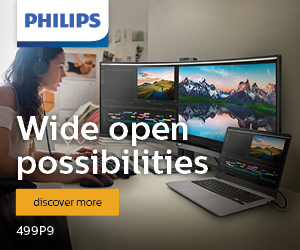 Those are the only changes we spotted, along with a price reduction of £10, which might suggest it would be tough to make a video talking about the features of the new model. 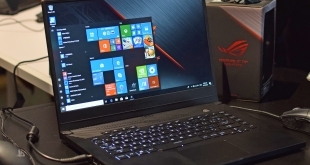 In fact it turned out to be more fun than we expected and the finished PC looked rather snazzy. 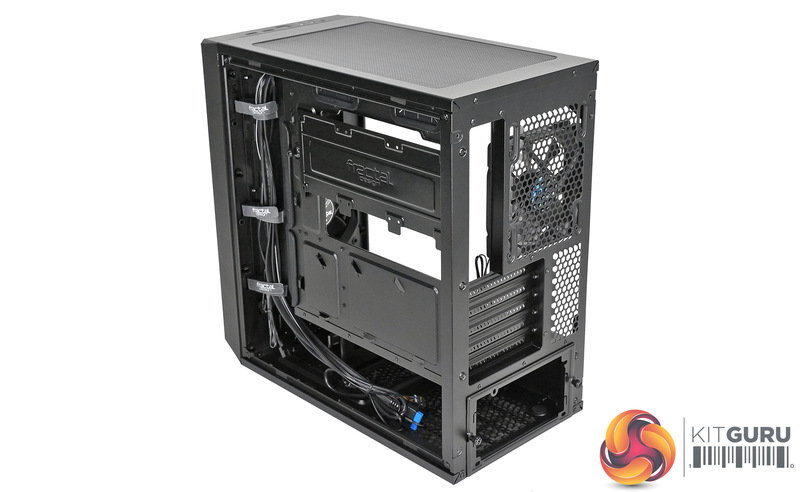 120mm radiator mounts: 120mm/240mm front, 120mm/240mm roof, 120mm rear. Internal drive bays: 2x 3.5”/2.5”, 3x 2.5″. 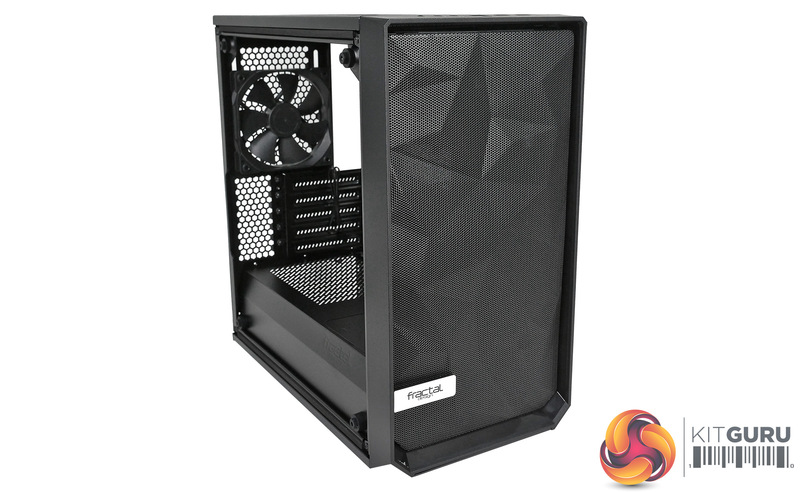 Dimensions: 412mm H x 409mm D x 217mm W.
Building a test system in the Meshify C Mini reminded us of the minor trials and tribulations we faced with the regular Meshify C. Removing the two side panels is quick and simple however the mesh front panel that gives the case its name is more tricky to remove as you have to find a hidden trigger and then the panel pops free. 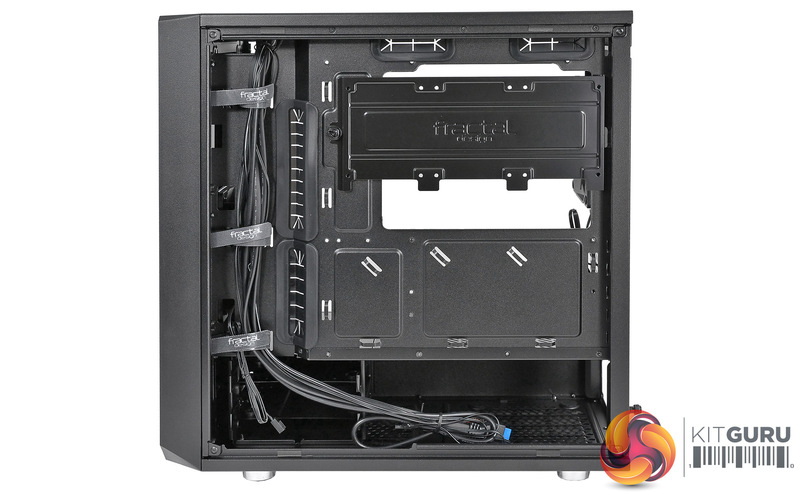 Installing the power supply from the rear of the chassis is easy enough, however the space for cables is quite tight if you retain the two stealth drive caddies that are also located under the power supply shroud. 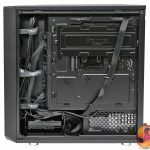 We have seen this approach a number of times from companies including Corsair and while it cleans up the main compartment, it potentially makes the area below the motherboard tight for space. 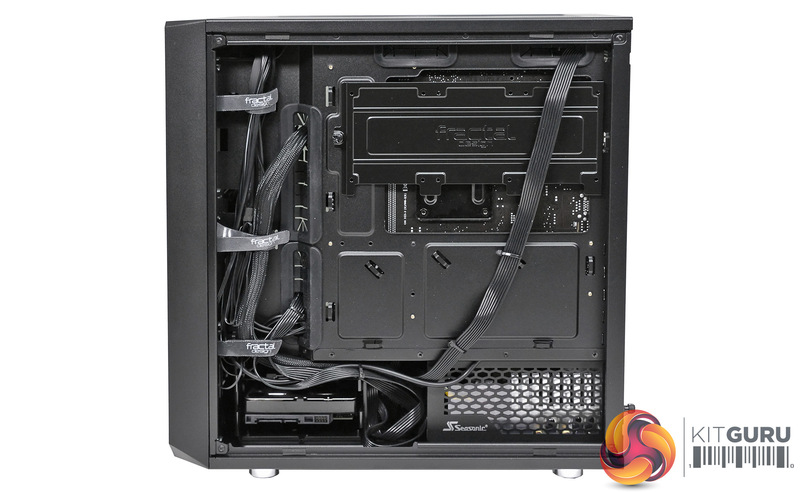 Fractal Design includes a deep channel for cable management that has three ‘hook-and-loop’ straps to keep the cables in place. 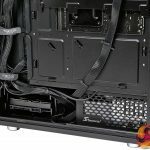 There are two enormous holes for passing cables into the main compartment through grommets that look good and work well. 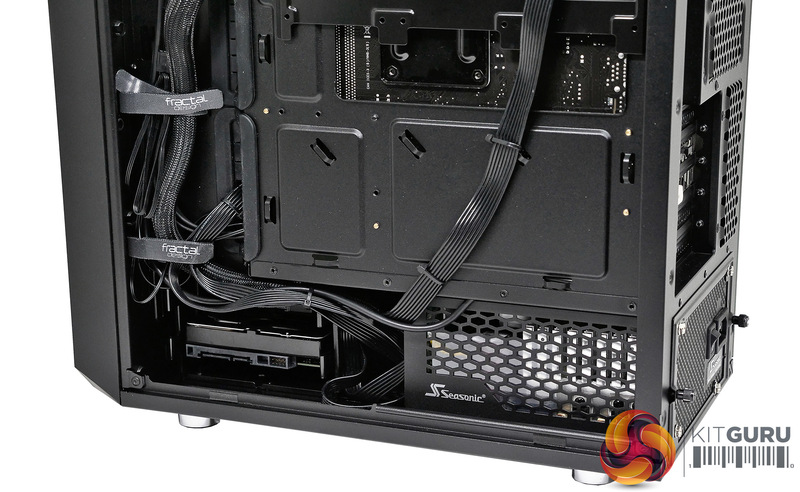 Fractal Design has not seen fit to include another hole and grommet in the power supply cover that would allow you to feed the graphics card power cables upwards. 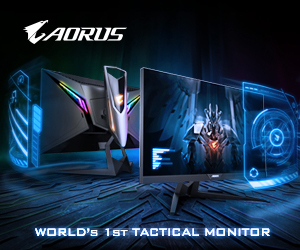 That might be an idea for the next version of this case. 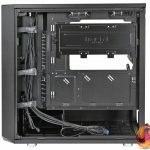 Connecting cables to the headers along the bottom edge of the motherboard for audio, front panel and USB is also a bit awkward as the holes in the power supply cover seem more like an afterthought, rather than being dedicated to the task. 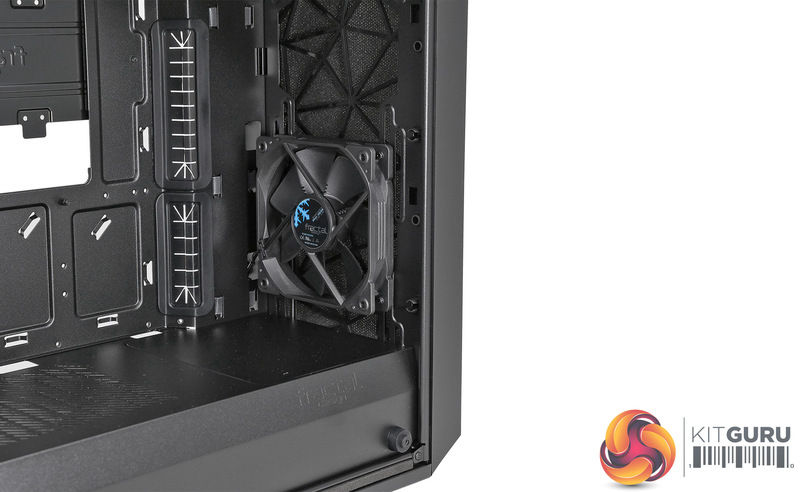 You can still remove the mid-plate in the power supply cover and then remove the drive caddies to create a larger space for cooling at the front of the case, however with the Meshify Mini C you cannot install a 360mm radiator. 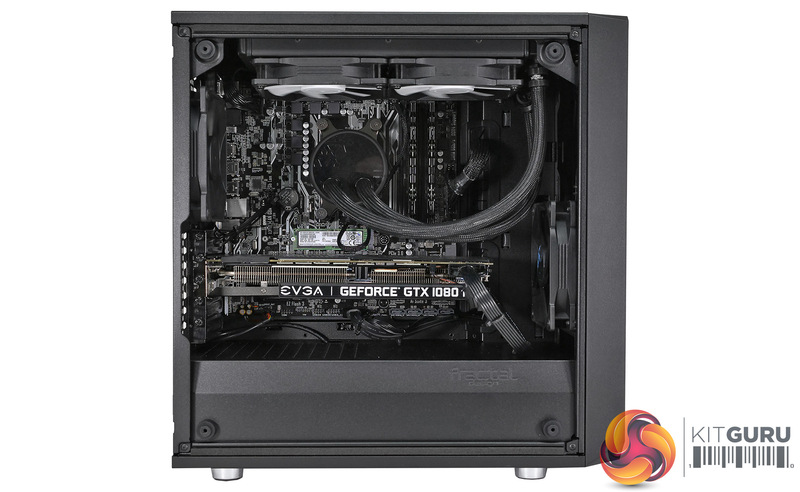 You can, if you choose, install three 120mm fans but frankly that seems unnecessary. 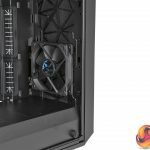 We instead chose to install a 240mm Fractal Design Celsius S24 cooler in the roof of the case while retaining the two supplied Fractal Design X2 GP-12 fans. 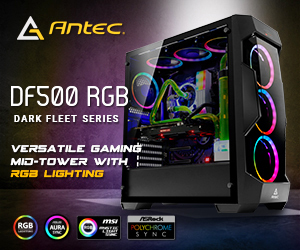 This presented an unexpected problem as the Asus Prime B350M-A we were using only has a single chassis fan header so we left the front fan disconnected. 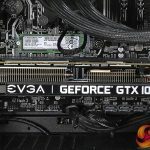 By their very nature Micro-ATX motherboards are smaller than ATX and as a result they often miss out on headers and connectors. 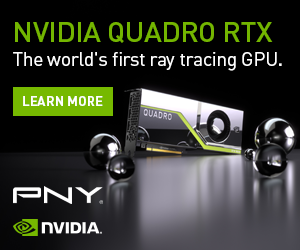 In this instance we were short of fan connectors. 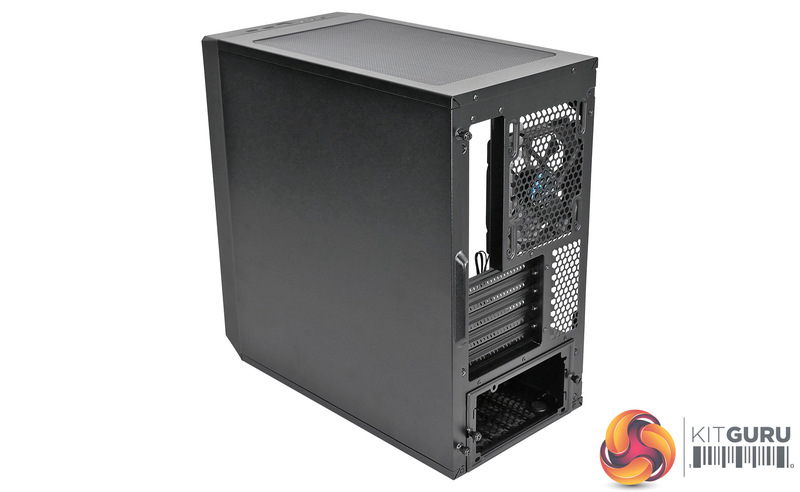 To put this case through its cooling paces we will be using a test system consisting of an AMD Ryzen 7 1700X, reference GTX 1080 Ti and an SSD. 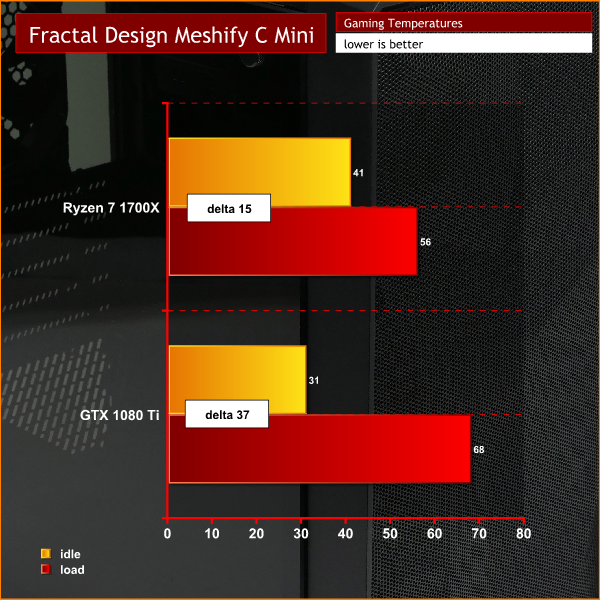 This system allows us to produce a substantial amount of heat and effectively test the Fractal Design Meshify C Mini‘s cooling capabilities. 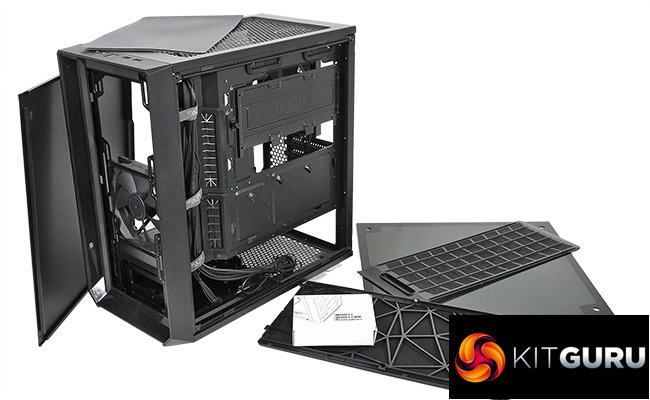 The Meshify series of cases breathe freely thanks to the design of the front panel and the open nature of the main compartment. 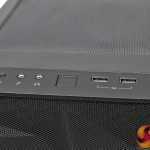 The good news here is that the smaller size of the Meshify C Mini has no obvious impact on performance, and both our Ryzen 7 1700X CPU and GTX 1080 Ti GPU remained cool under full load. 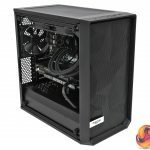 Fractal Design has made no obvious effort to reduce the noise levels of the Meshify C Mini yet despite that we had no problems with the noise from this case. 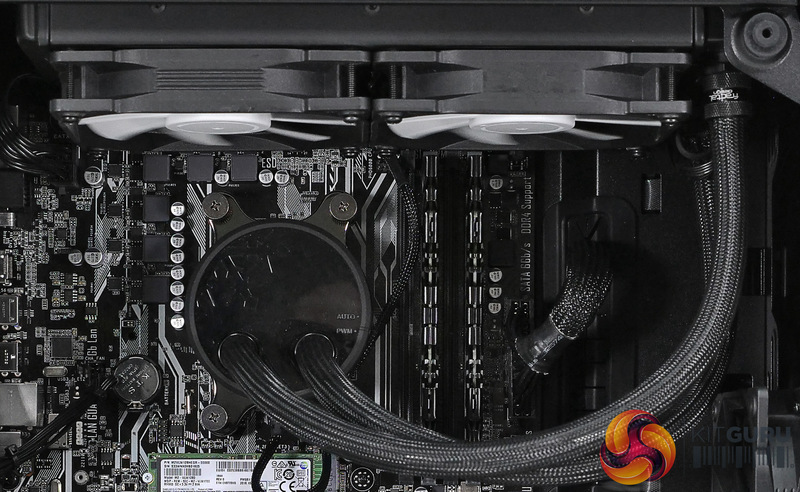 This is due at least in part to the fact that we were able to run the pair of fans on our chosen Celsius S24 cooler slowly and thus quietly. 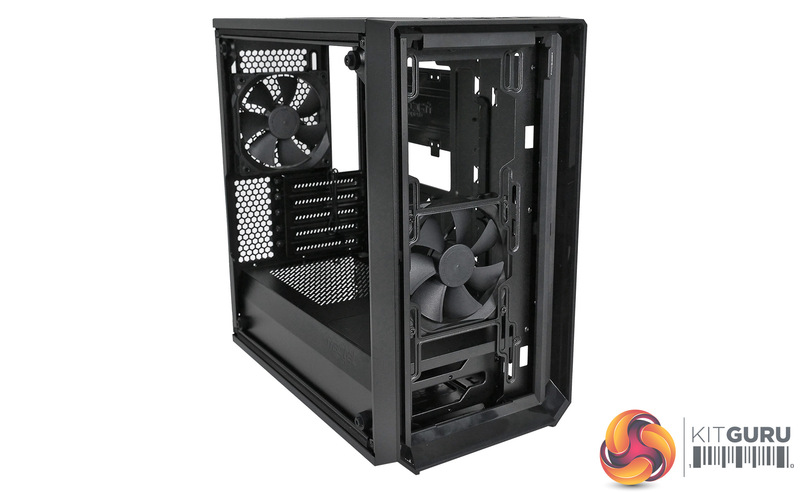 Although this case could easily become noisy if you run the fans at high speed, we are confident you should be able to balance cooling, air flow and noise. 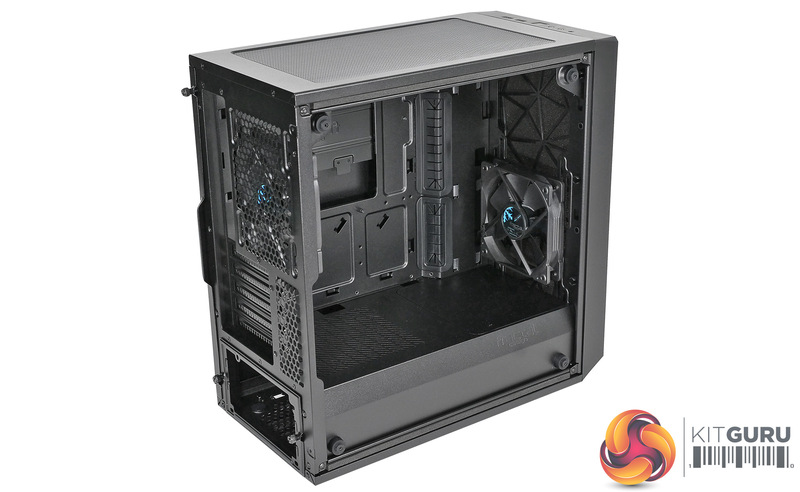 We like the Micro-ATX form factor but are well aware that smaller cases are often built down to a price. 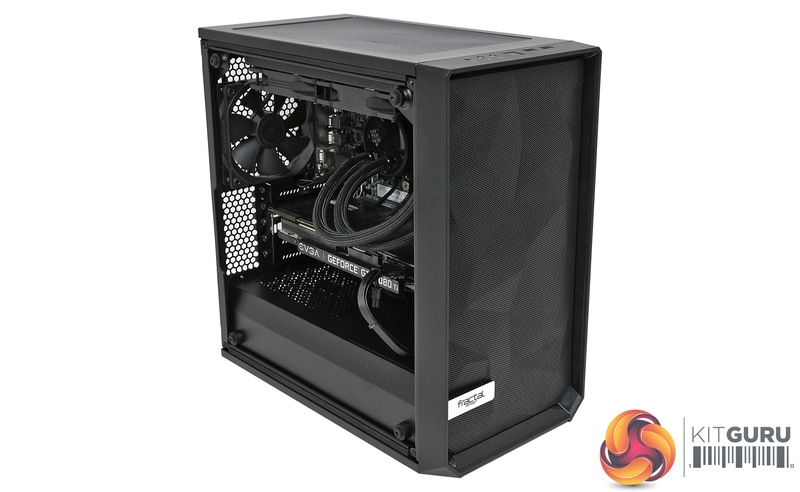 With the Micro-ATX Fractal Design Meshify C Mini we found it was very similar to the ATX Meshify C in terms of appearance and features however it is shorter, more compact and slightly cheaper. 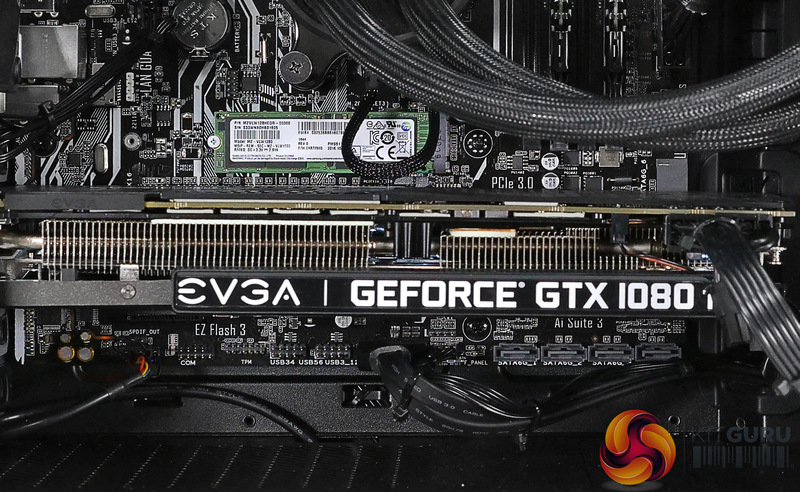 Building a high-end gaming PC with a Ryzen 7 1700X CPU and GTX 1080 Ti graphics was straightforward and we were impressed that cooling did not suffer in the slightest. 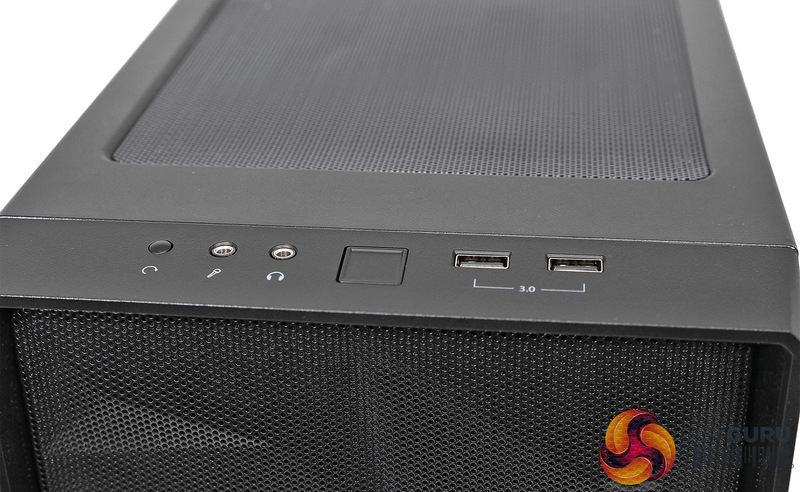 The finished PC looks good and has a decent amount of space inside the main compartment. 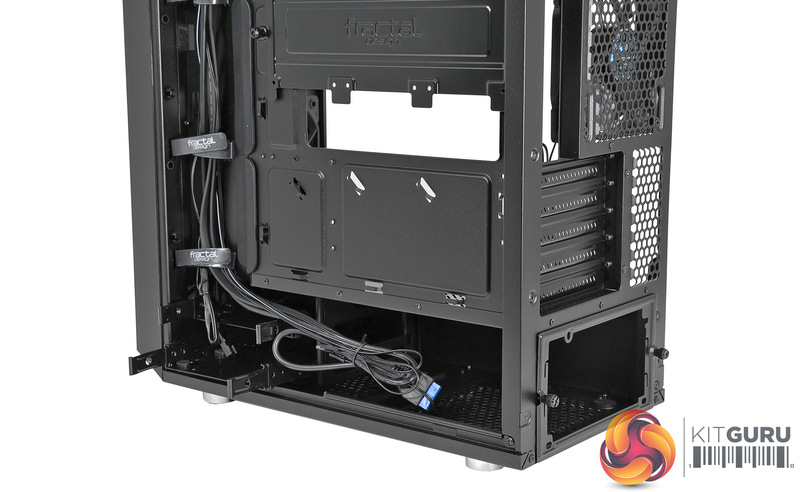 Added to that the Meshify Mini C is fully filtered and has decent cable management as well. 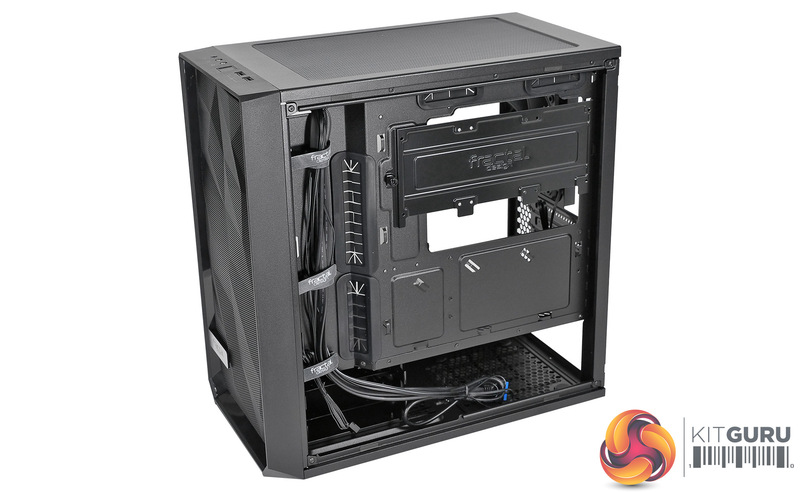 While we like the Meshify C Mini it is not perfect and in particular you will struggle to populate all the drive bays and still find space for the cables. 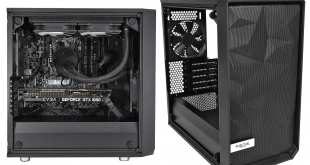 There is no noise deadening material either which means the Fractal Design might get noisy, so we advise you to choose your components carefully. 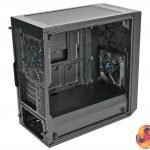 Overall we like the Fractal Design Meshify C Mini however we also know that many enthusiasts have little interest in the Micro-ATX form factor. 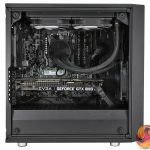 If you are one of the few who is considering a smaller motherboard, though, you really should take a closer look at the Meshify C Mini. The Meshify C Mini’s MSRP is listed at £79.99. 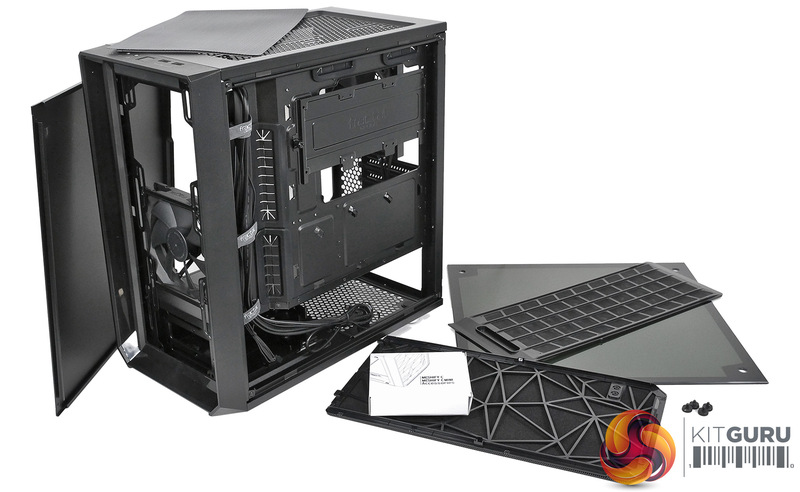 We can’t yet find a retailer stocking the case, but more information can be found on Fractal Design’s website. 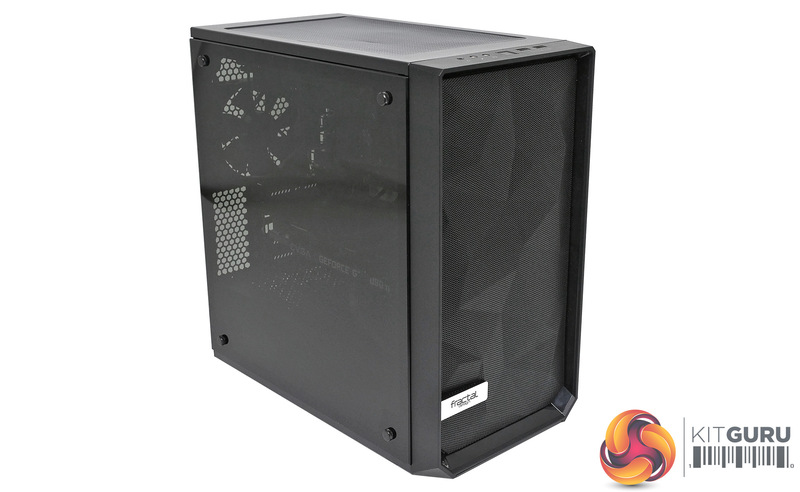 The front mesh panel allows for excellent air flow. 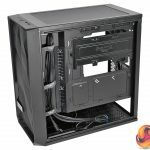 Plenty of options for liquid cooling. 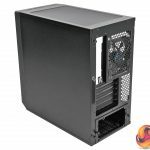 This Micro-ATX case is very compact. 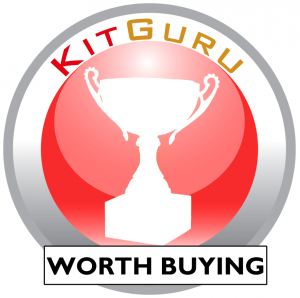 KitGuru says: Fractal Design shows us that Micro-ATX can be a winning form factor.